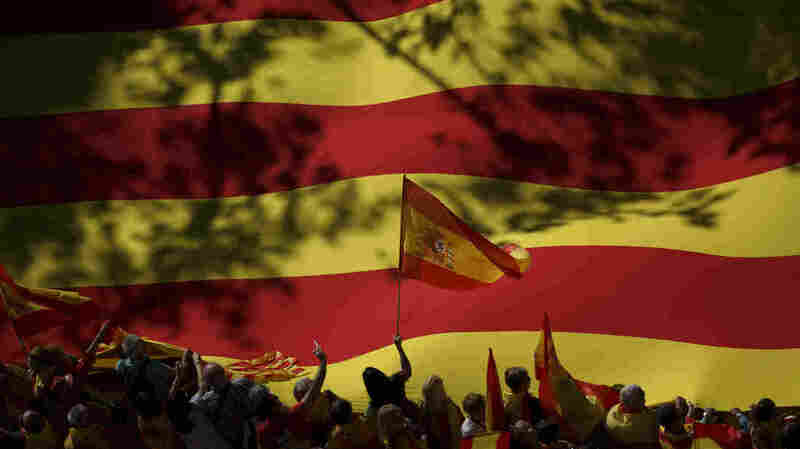 Spanish Nationalists Reject Catalan Independence In Barcelona March : The Two-Way Two days after the regional government voted to secede from Spain, demonstrators rejecting the move marched and brandished Spanish flags in Catalonia's capital. A nationalist activist waves a Spanish flag in front of a giant Catalan flag during a mass rally against Catalonia's declaration of independence, in Barcelona on Sunday. Hundreds of thousands of protesters decrying the Catalan government's push for independence came together in Barcelona on Sunday, in one of the biggest gatherings of Spanish unity supporters. 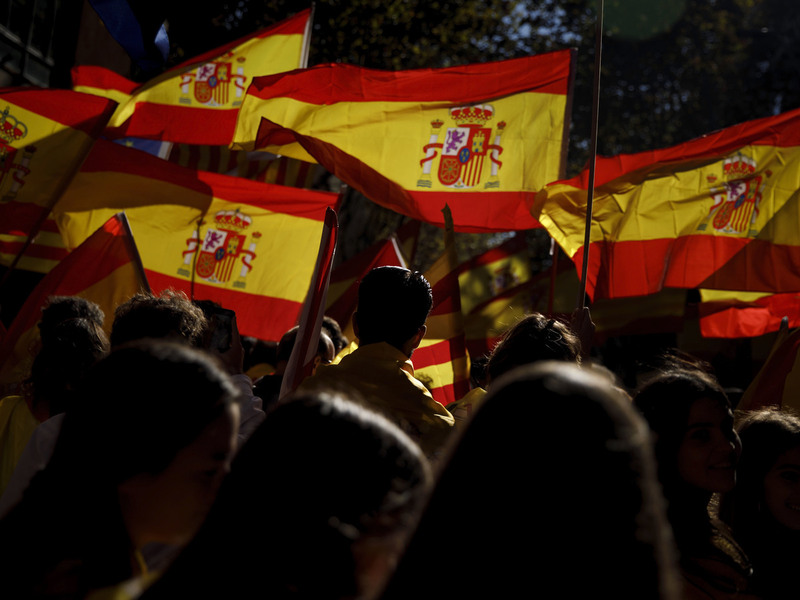 Waving flags and singing "Viva España," the marchers gave voice to what some have called the silent majority in a region whose government declared independence from Spain on Friday. Polls show roughly half of the Catalan electorate supports sticking with Spain, while the other half supports forming their own country. As NPR's Lauren Frayer has reported from Spain, those supporting unity have tended to be quieter than separatists because they are defending the status quo. "Support for staying in Spain had been growing in recent years, despite almost daily independence rallies in Barcelona, the Catalan capital," Lauren says. Sunday's rally capped a tumultuous weekend that saw the central government taking formal control of Catalonia on Saturday. Invoking Article 155 of the Spanish Constitution, Spanish Prime Minister Mariano Rajoy dissolved Parliament and fired Catalan leader Carles Puigdemont. Puigdemont issued a defiant statement Saturday saying only the regional parliament can elect or dismiss the Catalan government and vowing to "continue working to build a free country," reports The Associated Press. Demonstrators march with Spanish flags during a rally against Catalonia's declaration of independence in Barcelona on Sunday. But with their pay suspended, AP reports it is unclear what Puigdemont and other regional leaders will do now that Madrid has stepped in. Some Catalan civil servants have said they will not take orders from Madrid. And Puigdemont has been vague about what steps his supporters should take. Spanish Prime Minister Mariano Rajoy has set new regional elections for Dec. 21. In a violent and contentious referendum on Oct. 1, 90 percent of voters opted to secede from Spain. But Madrid had already deemed the vote illegal and only about half of eligible voters turned out. The United States and the European Union also rejected the results of the referendum and support a united Spain. Catalonia has been part of Spain since the 15th century, yet has retained a unique cultural identity and language, including its own flag, anthem and president. Many in the wealthy region have been unhappy with tax distribution; Catalonia pays $12 billion more in taxes to Madrid than it gets back, according to Spanish Treasury data, reports Reuters. Rajoy expressed support for Sunday's demonstration, tweeting pictures of marchers waving and wrapped in the Spanish flag and writing, "Harmony, peaceful coexistence and common sense, democracy and dialogue within the law."